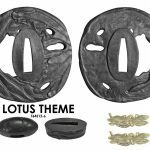 Additional thoughts, information and hints for our sword lines and products, including detailed introductions of new swords as they come in, special discounts and more. 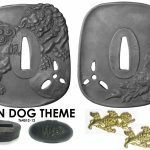 New from the Black Dragon Forge! It has been quite a few years since we have had any stock of the Black Dragon Forge, the name we have given to swords made by the forge we use to create the legendary SBG Custom Katana series. So it is with great pleasure that I announce a limited supply of new and improved designs are now available for immediate shipping. 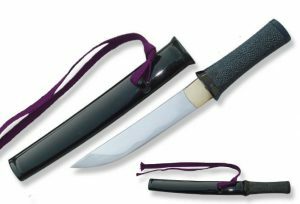 This time around we have four models on offer – a new and improved version of the Classic Black Dragon elite, with folded T10 tool steel blade, real hamon, rayskin wrapped saya, leather ito with hishigami – you name it, it has it.. 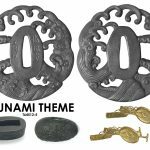 This sword alone is worth the price of admission, and is complimented by its cousin, a Sanmai laminated sword with a similar classic style but with a rattan reinforced saya. And finally, a truly original design and part of the Legendary Swords Project – the Hobgoblin Jintachi we have named the Bakemonogatana. 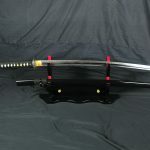 While the sword is functional sword art, it is based on real world designs seen in Filipino fighting swords, the Turkish Kijili and the Bujinkan Shibobigatana and is extremely versatile and has a rich backstory to accompany it as the weapon crafted and used by the brutal Hogoblins – changelings from the Harmonious Isles that have come to Eletreus and dominated the worlds last known supply of Coronatite..
Stocks are very limited – 10pcs each of the Elite Mk II and the Sanmai Katana, 4 of the Oyabun and 20 Hobgoblins. And once sold, who knows when they will be restocked (from memory, it has been at least 3 years). So at the very least have a look and see what’s on offer before they are gone. They make ideal Christmas gifts as they are new and rare, there is no danger of buying one of these and finding the recipient already has one..! More deals coming soon as we ramp up for Christmas sales so be sure to check back often! Just finished a bit of a quick upgrade to the store by improving the navigation a bit. I think that previously it was set up to make it easy for ME to find things there rather than site visitors – after all, I kind of knew what I was looking for when I use it, and casual or first time visitors to the store would probably end up with a little too much info, so I have simplified the side menu and used larger icon blocks instead of text to make finding broad categories easier and, I hope, more intuitive. Still a few tweaks here and there needed to make it even more user friendly, but one thing at a time. Speaking of small tweaks here and there, I decided to change up one of our special offers to what I was originally planning – and that is to offer the new basic 1045 Tantos as a free gift with every budget $149 entry level Katana to deliver the best value possible for our most affordable sword. 1060 Carbon Steel w/real hamon just $149.99! It’s not easy to do, as the margins are so low to offer anything free on top is a stretch (which is why I changed it at the last minute) but in the end I wanted to make the very best deal possible so have changed it up accordingly. Find it and more in the Hot Specials Section, now prominently displayed at the top of the page. A bit of a special one..
A bit of a special sword to talk about in this post..
As part of the Legendary Swords Project, we have been collaborating with several US based artisans – and here we teamed up with Jeffrey R. Robinson, also known as Brother Banzai on the SBG forums, who has given one of our high end Forge Direct Feathesteel blade the Bronze by Jeffrey Robinson treatment..
And the results, well – they speak for themselves.. The sword here is the prototype for the Seraph Aegis, the ORIGINAL sword which a limited edition run of 20pcs that will become available over the coming months is based on.. And the ORIGINAL is for sale – at around the same price that the standard stock removal swords are sold at – and even includes a matching custom made scabbard as well! 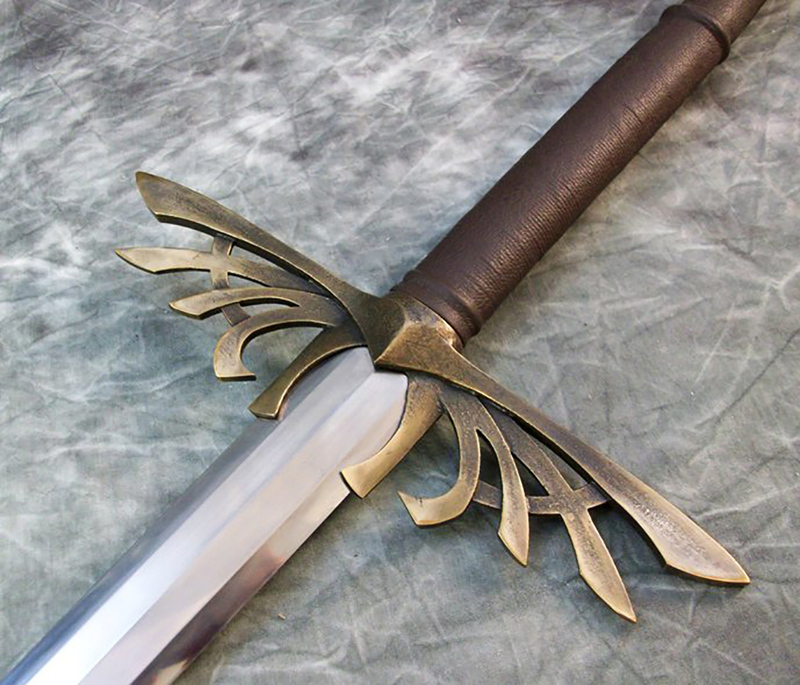 The blade is both strong, with an Octagonal cross section capable of withstanding a surprising amount of punishment, and the solid bronze fittings are also sturdy and perfectly fitted to create a work of sword art that is as beautiful as it is deadly.. Naturally, there is only 1 available and rather than charge a premium for it, we are selling it almost at cost price..! So if you are in the high end custom sword market and interested in something both original, beautiful and that is a part of SBG history – you really do need to take a close look at this one.. 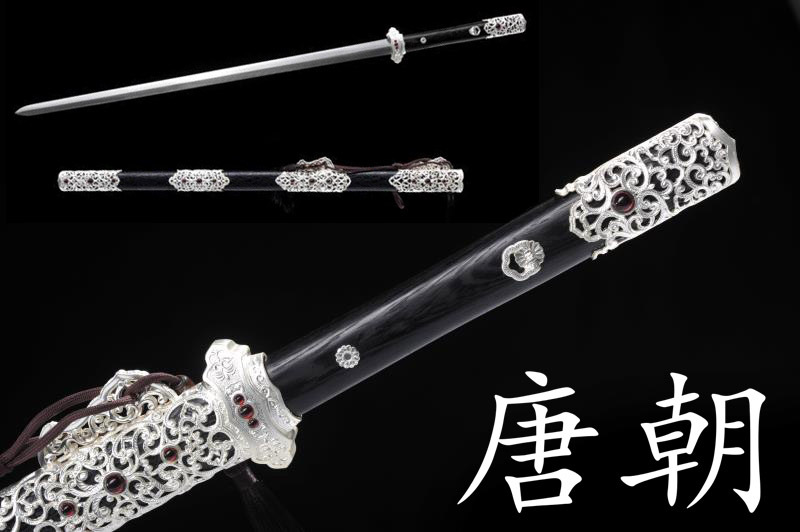 Following hot on the heels of the Yong Lo Sword is a second budget Chinese Sword that looks like it should be sold for so much more than the asking price..
Ornate and highly detailed, at first glance it looks like it could be one of the high end swords from forge direct, and indeed if the blade was folded – it could be passed off as such which is what many sellers actually do, but at SBG we go the other way, sell it for a price based on what it costs – not what it looks like it should cost – and don’t mess around with a cheap and nasty folded blade but rather a nice monotempered 65mn Spring Steel blade with satin polish finish. 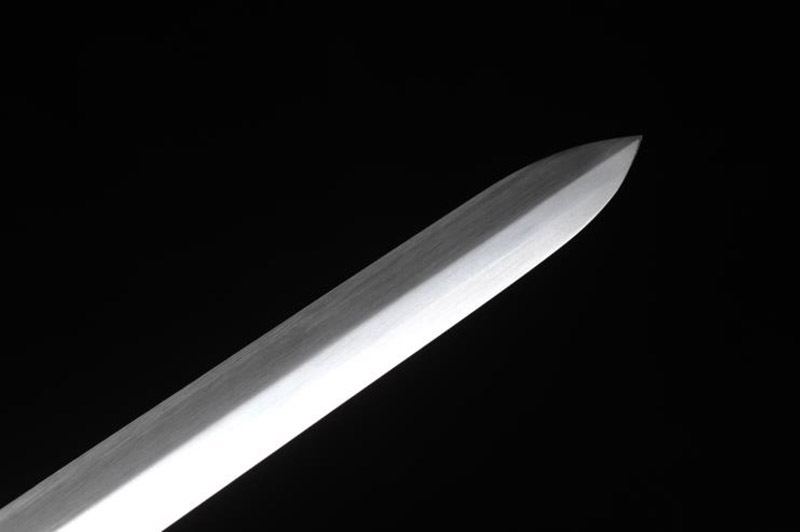 Apart from the crazy low price, and how attractive it looks, the most outstanding feature of this sword is the lighting fast handling – weighing only 2.1lbs with a point of balance 3.75″ from the guard! Here is a quick video of the sword in action with a flex test and some tatami mat cutting at the forge where it is made. 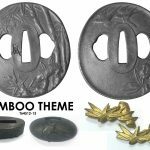 Pretty good value, and our contribution to keeping sellers of Chinese Swords honest. 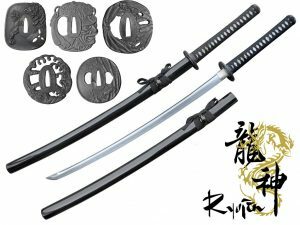 ANOTHER New Sword from Ryujin – $149.99 Custom 1060 Carbon Steel..! What a fantastic month August has been for lovers of Japanese swords – just looking at the updates on the blog, first there was the 5160 Elite Custom Katana from Ryujin, the return of the Ryujin Gunto, launch of the Forge Direct Custom Wakizashi and Ko Katana, the new WarFire Katana by Dragon King – and now – perhaps the best deal of them all so far..
A Differentially Hardened 1060 Carbon Steel Katana with steel fittings, cotton ito and 5 different sets of Koshirae available for just $149.99!! That is the price most other sword sellers offer a differentially hardened 1045 carbon steel sword with cheap alloy fittings for..! 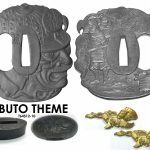 Truly amazing value, need I really say anything else other than as it’s a trial run there aren’t all that many in stock, especially considering the low price they are being offered for.. $270 worth of sword for $150 is a pretty crazy deal – check them out below while we still have some in stock..